Vineyards in the Aube: Côte des Bar. The soil structure is chalky (and stays moist deep down creating a permanent reservoir for the vines) with a clay-limestone surface layer. The Aube is mostly marl. The climate is mild, cool and wet with spring frosts. Grape varieties are Pinot Noir (Montagne de Reims, Côte des Bar), Pinot Meunier (Epernay and the Marne valley), Chardonnay (Côte des Blancs and Sézanne) but also Pinot Blanc, Pinot Gris, Petit Meslier and Arbane. 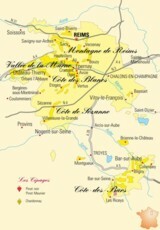 The wines made are AOC: Champagne of course but also Côteaux-Champenois, Rosé-des-riceys and Bouzy. Outside of AOC, Vins de Pays des Coteaux-de-Coiffy. If 70% of production is processed by the ‘négoce’ companies (who buy grapes and base wines), virtually all of the vineyards belong to 18,000 growers. 5,000 are ‘récoltants manipulants’ (grape growers and winemakers); they can be identified by two small initials at the bottom of the label: RM or CM for winemaking cooperatives. In Verzenay (Montagne de Reims); the Vine and Champagne Museum set up inside a lighthouse (built for advertising purposes in 1909). In Epernay, the Champagne Houses along Champagne Avenue. An educational winegrowers trail starting in Mutigny, a cruise leaving from Cumières or a visit to Hautvilliers (Dom Perignon). In the Marne, you can get discounts with the Marnotherapy card. Les Riceys (Côte des Bar): the only village to have 3 AOCs; Coteaux Champenois, Champagne and the celebrated secret Rosé des Riceys (e.g. see: http://champagneguydeforez.com/). The ‘grower’s pathway’ starting in Celles-sur-Ource (Côte des Bar): 11 km of wonderful scenery. Château de Bligny (Côte des Bar) lets you combine visiting a 17th Century château with tasting excellent champagne. A ‘clos’ is a vineyard surrounded by walls, which cannot be crossed by a cavalier and his mount. A ‘clos’ Champagne is only made from grapes from that vineyard. Champagne has five of them: Clos des Goisses in Mareuil-sur-Aÿ (Champagne Philiponnat), Clos du Moulin (Champagne Cattier) in Chigny-les-Roses, Clos du Mesnil (Champagne Krug in Le Mesnil), Clos Saint-Jacques and Clos des Chaudes Terres (Bollinger in Ay). An 8km hike starting from Courteron lets you discover the ‘cadoles’: a traditional dry stone hut used by grape growers.